Islamabad, February 10: The Election Commission of Pakistan is as independent and powerful as the Election Commission of India, but lacks the capacity to enforce, and the credibility of Election Commission is critical for democratic continuity, said experts at a Roundtable held by PILDAT. 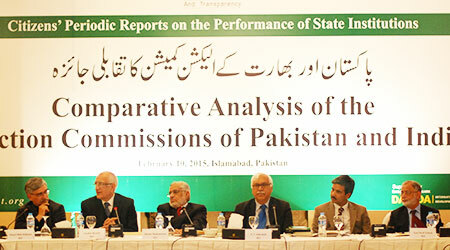 It was recognized that transparency, fairness, and right to information are crucial to the functioning of the ECP. The ECP must make efforts to reform its Complaint Redressal Mechanisms, while the Representation of the People Act of 1976 should be improved to ensure effective time-bound mechanisms for dealing with pre-election and post-election complaints. Provisions can be made in the Representation of the People Act to establish a real efficient monitoring cell at the ECP Headquarters in order to collect information for the purpose of scrutiny of nomination papers by Returning Officers, election campaigns, polling day, and post-election matters. Dr. S. Y. Quraishi, former Chief Election Commissioner of India, and Mr. Hasan Muhammad, former Secretary, the Election Commission of Pakistan, also the authors of the publications, spoke at the Roundtable discussion. The Panelists were Mr. Shahid Hamid, Senior Advocate, Supreme Court of Pakistan; former Governor of the Punjab and Dr. Ijaz Shafi Gilani, Chairman of Gallup Pakistan. Present at the Roundtable were Mr. J. P. Singh, Deputy High Commissioner of India to Pakistan, and Mr. Wazir Ahmed Khan Jogazai, former Deputy Speaker, National Assembly of Pakistan. Speaking on the occasion, Dr. Quraishi, said that the ECI has so far conducted 16 national level elections and 360 state level elections. It has never missed a deadline for conducting elections, and trust in the ECI has increased over time. The integrity and intentions of the ECI have never been doubted even though India is the most complex, diverse and multi-faceted country. Mainly because the electoral process in India is inclusive with universal and equal voting rights for both women and men is ensured, giving equal access to physically handicapped people. With 834 million registered voters, 11 million voting staff, all Government servants, with 8000 candidates, combined make the elections in India the largest elections of the world. Dr. Quraishi emphasized the sanctity of votes and stressed that every vote counts and is not to be taken for granted. The key is to raise the bar for improving elections every time. For instance, in the past, there were a lot of murders and other crimes during the elections. This was very seriously addressed by strict enforcement of law and vigilance. The most significant aspect is that the census is conducted periodically and hence the delimitations are carried out after every census. Electoral rolls are maintained and updated regularly. To ensure the neutrality and impartiality of the polling the staff is mobilized and randomized. The key the ECI’s ability to enforce the laws and powers granted by the constitution and under the laws. Mr. Hasan Muhammad added that the procedure and the legal regime in Pakistan are transparent, however there are some gaps in implementation and execution. The Election Commission of Pakistan has performed commendably under the circumstance when there were many incidents of terrorism. Certain aspects of the General Election 2013 could have been better, for instance, in certain areas the polling did not even start by 2:00 pm, though it is supposed to start at 8:00am, especially in Karachi and some places in Balochistan. Rather than increasing the time for voting, voting at those polling stations could have been postponed. The selection and training of the polling staff was done with due diligence. Mr. Hasan Muhammad recommended a series of electoral reforms, especially the adoption of electronic voting technology. The Chief Election Commissioner should be selected from amongst the retired civil servants who have credibility and integrity. This is due to the fact that the nature of responsibilities of the CEC is 70% administrative and 30% judicial. The most critical aspect to ensure transparency in elections is the effective implementation of right to information. Mr. Shahid Hamid gave a legal perspective and said that the ECP and Supreme Court are at par, as both are given the same powers under the Constitution of Pakistan 1973. Once the elections are announced the ECP can take over the administration just as in India for they have this authority under the constitution. In the historical context the performance of the ECP has been satisfactory, with some exceptions of a few constituencies where there were cases of rigging, however majority of the previous elections were transparent. Dr. Ijaz Shafi Gilani said that the trust and credibility of the ECI gives it a moral power, which makes it effective and efficient. On the other hand a self-imposed discipline amongst the politicians is something that can improve the overall electoral process, as is the case of India. On the other hand in Pakistan the ECP has not been able to inspire trust amongst citizens, therefore it has not been able to perform as effectively and efficiently as is needed. The Roundtable was attended by a large number of MNAs and civil society representatives alongside the media. Prominent among the attendees were Mr. Usman Khan Tarrakai, (MNA, AJIP), Molana Ameer Zaman (MNA, JUI-F), Mr. Khusro Bakhtiyar (MNA, PML-N), Ms. Sabiha Nazir (MNA, PML-N), Ms. Amra Khan (MNA, PML-N), Mr. Salman Khan Baloch (MNA, MQM), Rana Afzal Khan (MNA, PML-N), Ms. Shahida Rehmani (MNA, PPPP),Ms. Surriya Jatoi (MNA, PPPP), Sardar Kamal Khan Chang (MNA, PPPP), Ms. Mussarat Mahesar (MNA, PPPP) Ms. Belum Hasnain (MNA, PPPP), Mr. Saleem Rehman (MNA, PTI), Mr. Sajid Nawaz (MNA, PTI), Ms. Ayesha Gulalai (MNA, PTI), Senator Naseema Ahsan (BNP-A), Mr. Hamid ul Haq Khalil (MNA, PTI) Mr. Zaeem Qadri (MPA, PML-N), Molana Kakar (MPA, JUI-F) and Sahibzada Muhammad Yaqub (MNA, JI). In his welcome remarks, Mr. Ahmed Bilal Mehboob, President, PILDAT, said the aim and objectives of the Roundtable are to understand the performance of the ECP, identify gaps in its performance in the General Elections 2013, and offer recommendations that pave the way for more successful elections in the future. While explaining the purpose of the Roundtable, he said that the presence of Dr. S. Y. Quraishi is an opportunity to learn from the experiences of the ECI especially the use of Electronic Voting Machines. It is also pertinent to understand how to ECI has been successful in appointing impartial and neutral polling staff as there is no caretaker Government. It would be an immense learning through his experience how the ECI has evolved as a credible institution. The publications by PILDAT as well as the Roundtable are part of a programme to periodically ascertain the performance of key State Institutions in Pakistan. PILDAT is undertaking the assessment under its of Democracy and Governance Programme for which it has received financial support from the Danish International Development Agency – DANIDA, Government of Denmark.